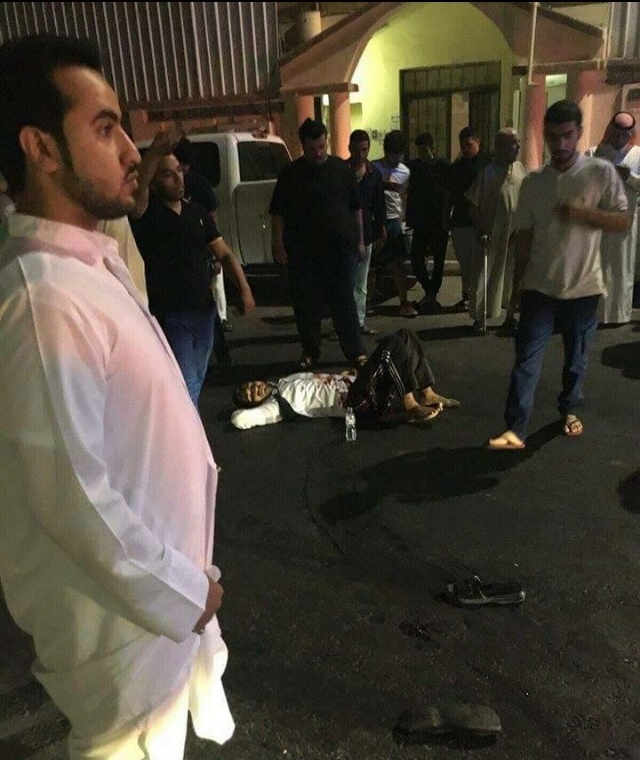 JNN 17 Oct 2015 Riyadh : An Islamic State Terrorists has shot Martyred five Shia Men at a Muharram gathering in eastern Province of Saudi Arabia before police shot him dead. A group claiming affiliation with the Islamic State of Iraq and the Levant said it carried out the attack on Friday. “As result of his shooting, five citizens… were killed, including a woman. Nine others were wounded,” an interior ministry spokesman said in a statement. He said that at about 7pm (16:00 GMT) on Friday, a suspect with an automatic weapon “started to shoot randomly” at al-Haidaria hussainiya in the Saihat area of Qatif city. Police intervened and opened fire, killing the suspect, the spokesman said without giving details about the attacker. “ Wounded, including a woman, in the shooting,” the Independent Media reported , adding that the attacker was 20 years old and Belonged to the Wahabi / Takfiri Group of IS , which has been financed majorly by Saudi Monarchy and Persian Gulf Sheikhdoms , in order to save their Thrones from the desperate citizens of their countries. “The situation is still under investigation,” he said. A group calling itself Islamic State-Bahrain State said in a statement that one of its “soldiers”, Shughaa al-Dosari, “attacked a Shia infidel temple with an automatic weapon” in Saihat. The group posted a picture of the alleged attacker and warned that “infidels will not be safe in the island of Muhammad”. In May 2015, ISIL claimed responsibility for a suicide bombing during midday prayers at a mosque in eastern Saudi Arabia. The Saudi Health Ministry said at least 21 Shia Men were killed and more than 120 others injured. Another suicide bomber killed at least 15 people in an attack on a mosque used by members of a local security force in southwest Saudi Arabia in August. The shooting, in the Qatif area of Eastern Province, came two days after the start of commemorations of Muharram , one of the holiest Month of the Muslims , which is commemorated by the Muslims across the World , except the followers of Wahabi Ideology. During Muharram last year, gunmen Martyred seven Shia Mourners, including children, in the eastern town of Al-Dalwa. The interior ministry said the suspects in the unprecedented attack were linked to the Islamic State group. This entry was posted in Jafria, Middle East and tagged Eastern Province, Hussainiya, Imambargah, IS, Islamic State, Qatif, Saudi Arabia, Terrorists, Wahabi. Bookmark the permalink. FIVE FOLLOWERS OF PANJATAN GO STRAIGHT TO JANNAH , MARTYRS WHILE PRAYING , MOURNING IS ALSO A KIND OF PRAYER . AGAINST THIS THE MALOUN TAKFIRI SAUDI , I AM SURE STRAIGHT GOES TO HELL WHERE HIS FELLOW PATRIOTS WERE WAITING FOR HIM .